As humidity grows, so does the chance for rain. Little change from yesterday except the humidity has finally reached uncomfortable levels again. So, with higher humidity to work with we have to start taking those ever present “rain chances” a bit more seriously. But it takes more than heat and humidity to make it rain. The upper level wind patterns have a lot to say about it as well. For instance, yesterday we had a weak upper air disturbance pass over – plenty of clouds, but the lower atmosphere was so dry that rain didn’t form. A similar disturbance today, would probably bring us some rain. So, now that the surface air is “primed” the upper air energy becomes critical. This afternoon: Partly cloudy and muggy…upper 80’s (no rain) Tonight: Partly cloudy warm and muggy…low…72 Thursday: Partly cloudy, hot and humid…high near 90 (1st day of PGA looks good) Then things get more complicated. The upper air energy is expected to turn its attention toward our part of the Ohio Valley. Now the timing becomes important. We know how rain/storm systems tend to fade quickly after midnight and then regenerate the next afternoon. The NAM brings the primary energy pool and chance for rain through the area during late night/morning Friday with NO afternoon regeneration here. On the other hand, the GFS brings the energy through in two pieces. The first pretty well matches the NAM, but the second should produce some afternoon thunderstorms. I lean toward the GFS and expect the primary time for rain Friday to be during the afternoon. Either way, I’d expect some rain delays during the PGA Friday. Beyond that, it still looks likely that the weekend should remain dry. 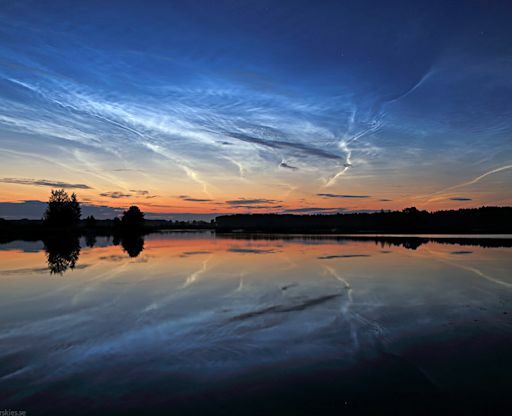 Noctilucent clouds (NCL’s) are probably the rarest clouds in our atmosphere and are certainly the HIGHEST seen over Earth. 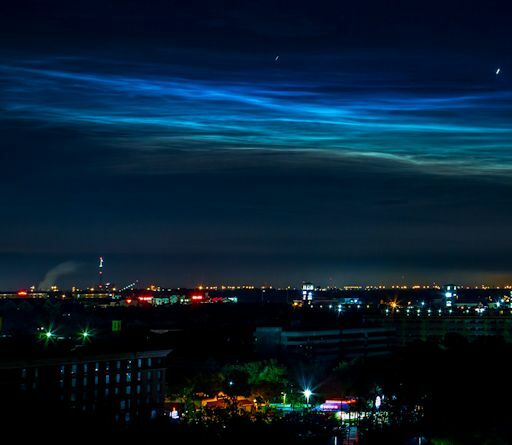 These thin, electric blue clouds are naturally seen about 30-50 miles above the Earth in polar regions during their summer seasons. 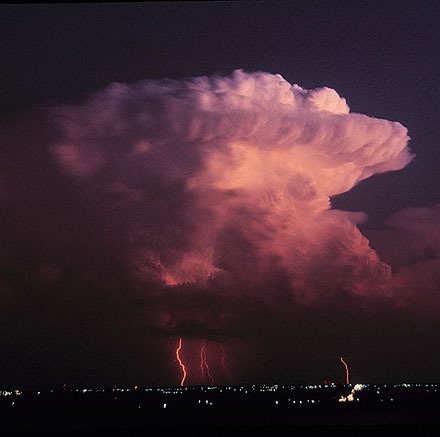 (In comparison, the tops of extremely strong thunderstorms only reach 12-13 miles high.) They are believed to be formed as moisture condenses around “meteor dust.” Few people have ever seen them. The pictures below are from www.spaceweather.com This one was taken by P.M. Heden of Sweden. We also have man-made varieties of NCLs. This picture was taken yesterday at Cape Canaveral about an hour and a half after AsiaSat 8 telecommunications satellite was launched by a SpaceX Falcon 9 rocket. The photographer was Mike Bartils. Spaceweather.com has a library of photos of NCLs if you’d like to see more. This entry was posted in forecast, Uncategorized, weather on August 6, 2014 by wx.